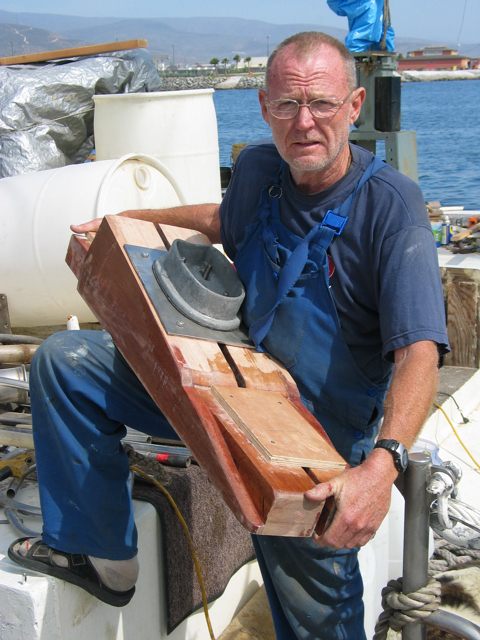 This evening I stumbled across a few photos of our mast step replacement project in Ensenada back in 2004, a pleasant surprise because I thought we had lost them all. Original mast step, looking forward from and into the bilge. The mast step on the Mason 43 (at least on ours) was very poorly made. I refrain from saying poorly "designed," for the drawings by the naval architect show something quite different. But the actual construction was remarkably inept, consisting of a pad made of few layers of plywood supported and raised above a drainage channel (and drainage pipe) by thin supports on either side, all encased in fiberglass. Evidently, the idea was to give the boat all the weaknesses of deck-stepped mast and none of the advantages. Water had found its way from the mast into the mast step, leading to the delamination of the plywood. We discovered the problem in Ensenada, Mexico when we noticed our slack rigging. Needless to say, we were quite distressed, all the more so because the boat was new to us. Moreover, Ensenada lacked any good options for pulling the mast. Fortunately we had become friends with crew on Infinity, a 120' ferro-cement ketch whose skipper/owner was busy gutting and rebuilding his boat while at anchor in the Ensenada harbor. He not only offered us space on his boat to build a new mast step but also convinced us that we could lift the mast using his mizzen. He also had all the materials I needed for the job (if I recall correctly, in exchange I built an instrument panel for his engine). The lifting operation seemed a little dicey to me, but we decided to give it go. Over the next while, I built our new and much improved mast step. Then, after choosing a proper weather window, we rafted up to Infinity and raised the mast just enough so that we could set it on the cabin sole. We moved our little family (me, two-year-old Lola, and pregnant Michelle) aboard Infinity. Then after we sealed off all the cupboards and lockers, I ground out the old mast step and epoxied the new mast step into place. For us it was a major victory over a potentially major problem. And it was fun, demonstrating what one could accomplish with a few friends. Original mast step, looking aft. Original mast step, looking forward. That's a water tank on the right. Colin (where the hell are you? Why don't you write) showing off the new mast step. That's me setting Momo's spinnaker pole for the lifting operation. Raising the mast -- Skipper Clemens at the winch on the mizzen mast, Colin guiding the mast on Momo's cabin top. Resting the mast on the cabin sole. Ready for the new mast step (looking aft). New mast step installed (looking aft). Jonas did the nice job on the stainless & aluminum.